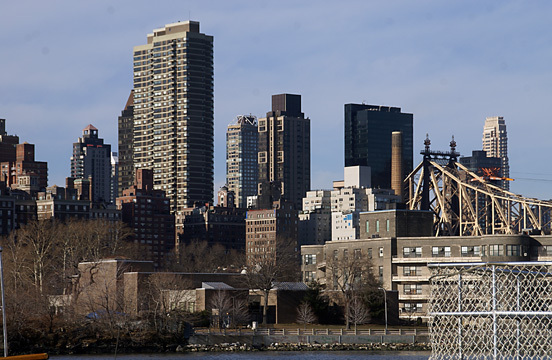 Sutton Place and Beekman Place are two of the city's most sought-after residential addresses. These small enclaves along the East River in midtown have some fine buildings, but their whole is greater than their parts. They have a gracious ambiance that is elegant but not too formal, impressive but not awesome. They are, however, rather deceptive for the public cannot really appreciate the glories of the riverfront buildings, some of whose facades are much better on the river than on the street as they incorporate bay windows and more elaborate massing to maximize views. Sutton Place is the larger of the two, but both combine apartment buildings and townhouses and the juxtaposition is dramatic and works well urbanistically. Sutton Place benefits from two public parks, one at 57th Street and another at 53rd Street, while Beekman Place has only one. Both have one great apartment building that sets the tone: One Sutton Place South is one of the city's premier addresses with a triple-arch driveway and a large lobby that opens onto its own large garden. One Beekman Place is not quite as imposing, but is very handsome and elegant. Sutton Place has two townhouse rows. The ones on the east side of 57th and the south side of 58th Street between Sutton Place and the river all share a large communal garden. 58th Street east of Sutton Place is known as Sutton Square, a name also given to the block of townhouses with the communal garden. Near the middle of the garden that slopes down to a promenade along the river, and over the F.D.R. Drive, is a large tree with a swing hanging down from one of its quite high branches. At the end of the street named Sutton Square is Riverview Terrace, a short private street with several townhouses that stretch to the north and overlook the East River. 1 Sutton Place is the grandest of the houses, a neo-Georgian style mansion that was built for Mrs. William K. Vanderbilt and designed by Mott B. Schmidt and is now the home of the Secretary-General of the United Nations. The other homes are an eclectic mix and many are owned by quite prominent New Yorkers. There are grander townhouses and mansions, but nothing compares with these because of the large garden and its spectacular view of the Queensboro Bridge, designed by Gustav Lindenthal, which may well be the most romantic in the city because of its Gothic-style tracery and multiple arcs. The garden's promenade is also an extremely exclusive and comfortable place to watch Macy's fireworks display on July 4th further down the river if one is fortunate enough to be invited by one of the townhouse owners. 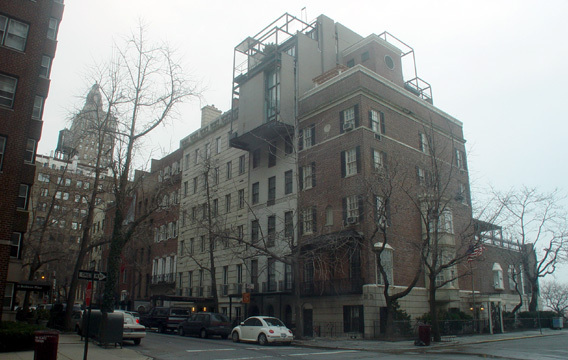 Some of the townhouses on Beekman Place are more interesting architectural, especially the unusual steel-cage-expanded one at 23 Beekman Place that belonged for many years at to Paul Rudolph, the great architect who died in 1997, and before that was belonged to Katherine Cornell, the actress. Rudolph, a major architect who for many years was also the dean of the Yale University School of Architecture, created one of the city's most unusual townhouse renovations with his "jungle gym" superstructure additions to the townhouse at 23 Beekman Place, which is just to the north of the impressive, but awkwardly proportional Georgian-style townhouse at 19-21 Beekman Place. 19-21 Beekman Place's red-brick facades nicely compliment the very impressive townhouse, one of the most spectacular in the city, at 17 Beekman Place directly across 50th Street that belonged for many years to Irving Berlin and is now the Permanent Mission of Luxembourg to the United Nations. It was erected in 1929 and designed by Harold Steiner for James Forrestal, the former Secretary of Defense. Irving Berlin acquired it in 1947 and lived there until his death in 1989 at the age of 101. Surprisingly one quite wide townhouse was on the market for many years without a buyer. One gets a sense in both Sutton Place and Beekman Place and Gramercy Park of how much greater New York could be for these eccentric neighborhoods are refined, comfortable, cozy, and redolent with a sense of peacefulness, respect for the environment, and caring for sane values of good-neighborliness. 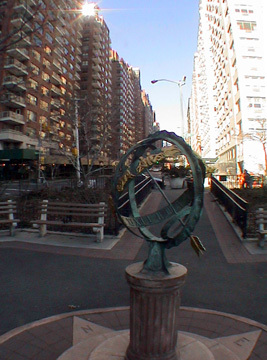 Of course, Beekman and Sutton Places have their share of snobs and elitists, and probably parvenus, but non-residents can take comfort in the fact that here at least is civilized waterfront with some public accessibility and that the residents must endure traveling through less pristine territory to get to their heavens. Tall building at right is River Tower, one of area's major residential skyscrapers. 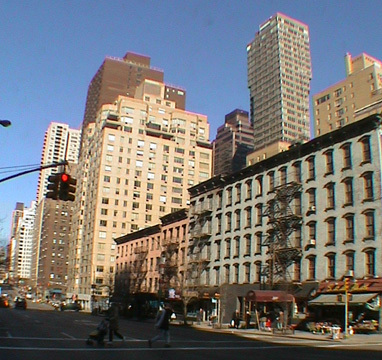 View is from First Avenue looking northeast. Indeed, the blocks between First and Third generally are not the city's most attractive, both on the long sidestreets and on the avenues. There are numerous surprises, however, as there are some quite impressive other apartment buildings nearby such as Rivertower at 420 East 54th Street, designed by Schuman, Lichtenstein, Claman & Efron, and St. James Tower, designed by Emery Roth & Sons, at 415 East 54th Street, east of First Avenue, and the buildings along the south side of 52nd Street east of First Avenue and the incomparable River House (see The City Review article), perhaps the best apartment building in the city, at 435 East 52nd Street, which straddles, and dominates, the separation between Beekman Place and Sutton Place. This area, of course, did not always have an illustrious history and in the 1930's, the play and movie, "Dead End," celebrated the tenement youth who frolicked in the East River beside the yachts of those who lived in new, mighty luxury towers. One Beekman Place does have one important advantage over its Sutton Place neighbors and that is that it not only backs handsomely on the river, but also has a south facade that overlooks the United Nations and its gardens and is separated considerably in elevation from the twin-towered modern buildings of 860 and 870 United Nations Plaza, designed by Harrison, Abramovitz & Harris. 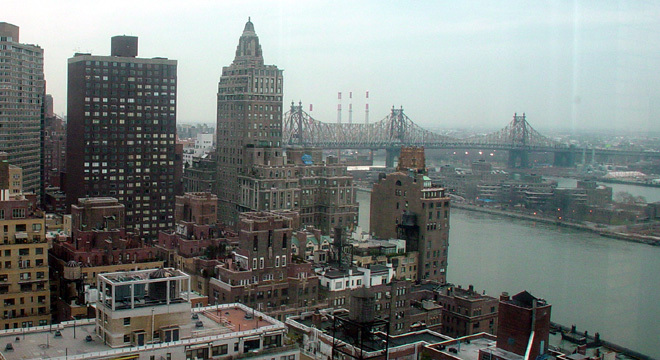 Indeed, one of the gateways to Beekman Place is the Beekman Tower at 3 Mitchell Place. This hotel was originally the Panhellenic Hotel, designed by John Mead Howells, one of the city's early Art Deco towers and one of the very few with a roof-top cocktail lounge that is one of the city's great secrets. The lounge remains open to the public although its terraces have now been enclosed in glass. The hotel had been designed to be used by women who were members of "Greek letter societies." It is reminiscent of Eliel Saarinen's famous second-prize entry in the important Chicago Tribune building competition. Howells was the partner of Raymond Hood for the first prize in that competition, a neo-Gothic tower that is now one of Chicago's most important landmarks. First Avenue is full of a wide variety of restaurants and services north of 49th Street and although it is often crammed for traffic bound to the Queensboro Bridge it has a lively retail activity that is quite attractive because so much of it services a rather well-to-do clientele. 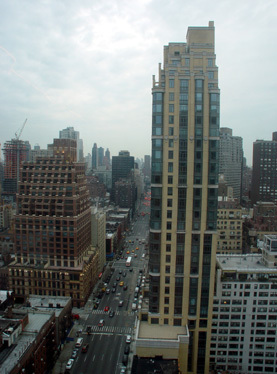 The surrounding area to the south began to change significantly at the start of the 21st century with the erection of several new "luxury" apartment towers on First Avenue between 48th and 50th Streets. Entrance to Gustavino's restaurant in the vaults under the Queensborough Bridge. 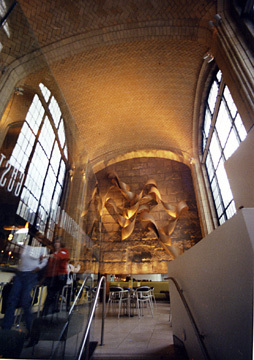 Large window on the right is reflected in glass wall in front of bar at left. Donald Trump's Trump World Plaza at 48th Street arrogantly rose much higher than the nearby United Nations and two smaller towers rose diagonally across from one another at 50th Street. 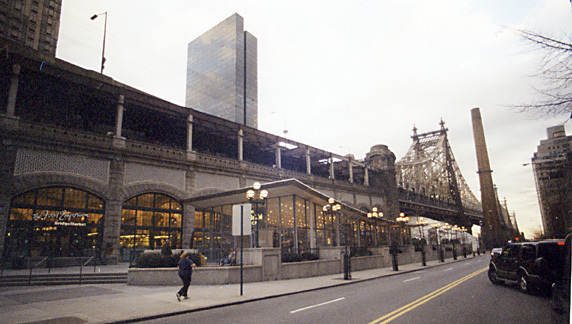 Around the same time, at the north, the arches under the Queensborough Bridge at First Avenue were redeveloped into a large supermarket and a huge and handsome restaurant, Gustavino's, and a free-standing and attractively modern Conran's store opened in the adjoining plaza. These developments have served the reinforce and solidify the desirability of the Sutton/Beekman neigbhorhoods. Beekman Hill is named after the site on the northwest corner of First Avenue and 51st Street of James Beekman's mansion, Mount Pleasant that was built in 1766 near East 51st Street and used by the British as their military headquarters in the city during the Revolutionary War and was where Nathan Hale was brought when he was captured before he was hung. George Washington visited the house often and the Beekmans occupied it until the 1854 cholera epidemic and it was demolished in 1874. The site is now occupied by the Romanesque Revival school building that once served as the United Nations International School and which now serves as the base of a new luxury apartment building, the Beekman Regent. The two blocks of Beekman Place were for many years cobblestoned. Many celebrities have made their home on Beekman Place included Irving Berlin, Ethel Barrymore and Alfred Lunt and Lynn Fontaine. Sutton Place is named after a developer, Effingham B. Sutton. It was formerly Avenue A and it becomes York Avenue north of the Queensborough Bridge. The area is quite far from the nearest subways on Lexington and Third Avenues. 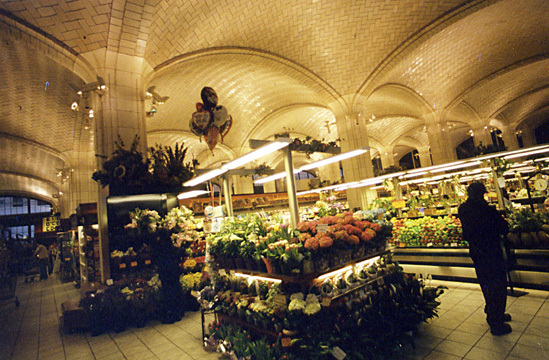 One of the longest running controversies involved the proposed redevelopment of Piranesian spaces beneath the Manhattan end of the Queensborough Bridge into a gourmet food emporium known as Bridgemarket. The project finally received approval and financing after about 20 years in the late 1990's, only to encounter new controversies between lessees. A large playing field beneath the bridge is converted to a private enclosed tennis facility/club in the winter, which is a nice amenity for the neighborhood. "When it comes to names, the question of the origin of the word 'Sutton' as used in the name of the prestigious enclave of Sutton Place has no easy answer. Although accounts as early as the 1920's identify Effingham B. Sutton as its original developer, no 19th century document has been found connecting him to the buildings that went up there in the 1870's and 1880's. It is known that Sutton ran a clipper ship line to the California coast in the 1850's that served Gold Rush hopefuls, and that he lived on West 29th Street between Eighth and Ninth Avenues (a block that was also called Lamartine Place and was set apart from the rest of the city's street grid because of separate numbering). 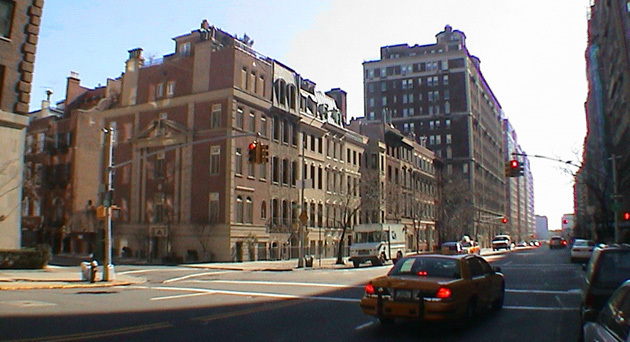 In 1875 a consortium of developers that included James Stokes, William Dodge and D. Willis James began to acquire property on Avenue A in the East 50's, on what is now called Sutton Place. Deed patterns suggest that they were working with a builder, Andrew Kerwin, who in 1879 put up the original Sutton Place enclave, 24 single-family brownstones on the block bounded by 58th and 59th Streets and Avenue A and the East River. Half of them faced the avenue and half faced a new street along the river briefly named Riverview Terrace. A few of those houses survive in recognizable form, three stories high with a stoop. Someone renamed the Avenue A side of the block Sutton Place. The earliest use of the term in the ProQuest digitized version of The New York Times occurs in 1883, in an obituary for Dr. David Holton, who died at his house on 'Sutton-place.'" "In this earliest period," the article continued, "Sutton Place began only at 58th Street, and extended up through 60th Street. Four-story apartment buildings soon went up, most built by Kerwin, on both sides of Sutton Place between 59th and 60th. The last of the buildings between 59th and 60th were demolished for the Queensboro Bridge in the early 1900's. Between 1880 and 1886 two developers built up the east side of what was then still Avenue A, between 57th and 58th Streets. In 1897, the block's residents petitioned the city's Board of Aldermen to rename their section Sutton Place. After that year the street covered three blocks, from 57th to 60th. Now the block of 57th to 58th, with its row of 1920's town houses and mansions, is considered the principal Sutton Place block. No one expected that a little out-of-the-way street would become one of the fanciest addresses in New York. But in 1920 a group of investors, apparently including the architect Eliot Cross, the Henry Phipps Estates (the real estate investment arm of the family of the steel magnate Henry Phipps) and the fledgling real estate firm of Webb & Knapp, began acquiring property in the area, especially the block of old brownstone buildings on the east side of Sutton Place from 57th to 58th, buildings that bordered directly on the East River. This consortium resold the old buildings to a group of buyers that included Anne Vanderbilt, the widow of William K. Vanderbilt (the grandson of Commodore Cornelius Vanderbilt, the builder of the original Grand Central Terminal); Anne Morgan, the daughter of J. Pierpont Morgan; and the decorator Elsie de Wolfe. These new owners remade the old brownstone buildings into new town houses of varying design. Mrs. Vanderbilt moved into the new house at 1 Sutton Place, at the northeast corner of 57th Street, and the arrival of the new residents shifted the social geography of New York slightly to the east. 'Mrs. William K. Vanderbilt to Live in Avenue A' was the headline in The Times, which used the original name to emphasize the contrast and noted that she was leading 'an exodus of society from Fifth Avenue and elsewhere.' The plots were snapped up, and the residents tore down the old backyard fences to create a common rear garden, a huge greensward overlooking the eddying whirlpools of the river. "At an Upper East Side riverfront location similar in many ways tothat of the pre-Civil War city, Mrs. William K. Vanderbilt and Anne Morgan organized Sutton Square. Whereas Turtle Bay Gardens was faintly bohemian, Sutton Square was definitely upper crust. The enclave married the flavor of London's Park Lane to that of old New York. Sutton Square was actually the name given the short leg of Fifty-eighth Street east of Sutton Place in 1920 when Vanderbilt and Morgan pioneered its redevelopment, but the enclave also included one short block along the east side of Sutton Place (really a fancy name for Avenue A) between Fifth-seventh and Fifty-eighth Streets and the East River. (To the north, between Fifty-eighth and Fifty-ninth streets, a continuous row of brownstones along Riverview Terrrace was separated from the river's bluff by an iron fence, gardens,and ten maple tress.) The term square referred not to a public park such as Union Square but to the common law and garden at the rear of the development that looked over the river to Blackwell's Island. To the south lay slums and tements and neglected brownstones, as well as the Peter Doelger Brewery, which occupied most of the block on the west side of the street from Fifty-fifth to Fifty-sixth Steet. Vanderbilt and Morgan were encouraged to pioneer the area by Elizabeth Marbury, a theatrical and literary agent and close confidante of the actress-turned-interior decorator Elsie de Wolfe. Marbury occupied a house at 13 Sutton Place remodeled by Mott B. Schmidt in 1920 and she persuaded Vanderbilt and Morgan to employ Schmidt,whose wife, Elena, was a decorator on de Wolfe's staff. The decision to develop the far east end of Fifty-seventh Street opened up to fashion the entire shoreline above the Forty-second Street slaughterhouses. Within a decade's time, this area of outmoded warehouses and piers would be dotted with a succession of exclusive residential enclaves. For the first time since the opening of Riverside Drive in the 1870s, fashionable New Yorkers were creating a neighborhood bordering on the city's principal natural asset - its waterfront....In the 1930s, when planning for the East River Drive got underway in earnest, the valuable connection with the water was maintained, and the fashionable coastal development along the East End's shore, with its buildings and gardens hanging over the water's edge, was maintained, although some of its more extravagant features such as the docks for private yachts and motor launches were sacrificed to the convenience of motorists. Mott B. Schmidt designed the Vanderbilt and Morgan houses as a coordinated pair in 1921. 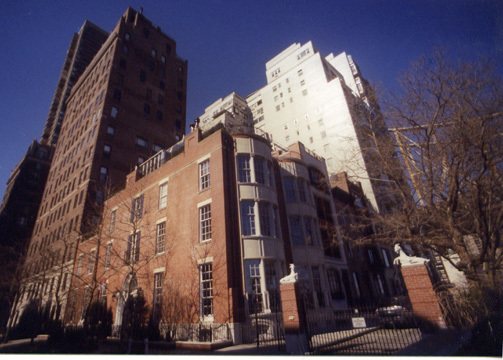 Mrs. Vanderbilt's house at One Sutton Place, at the corner of Fifty-seventh Street, was a free adaptation of the English Renaissance style, inspired principally by the example of Christopher Wren. Entered from Fifty-seventh Street, the house's principal facade was oriented toward the south while a modest facade, facing east, was scaled to the adjacent garden, which offered sweeping river views. Schmidt built the house on the site of the former residence of Effing B. Sutton, the original (and unsuccessful) developer of the neighborhood, and used brick taken from the old house. Anne Morgan's house at Three Sutton Place was smaller and its Georgian style was more specifically American....Renovation of the other brownstone houses in the Sutton Square block quickly followed. 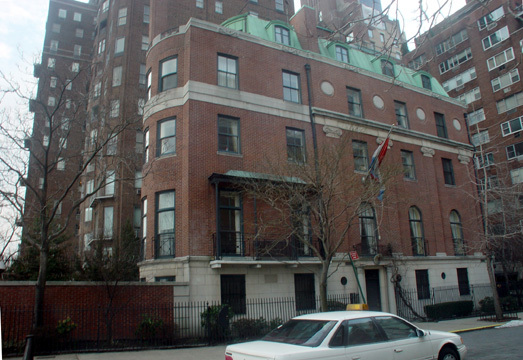 In 1921 William F. Dominick renovated the building at Seven Sutton Place for Mrs. Lorillard Cammann. Dominick's design, by no means as dramatic as Schmidt's, called for a simplification of the facade, which included resurfacing the brownstone with stucco, removing many of the moldings, and linking the rear second-floor windows with a delicate iron balcony. Murphy & Dana's adjoining houses at Six and Eight Sutton Square, circa 1922, combined three houses to form two that had plans which were intricately interlocked to maximize the river views. Mrs. Simeon Ford's residence at Two Sutton Square was remodeled in 1928 in a loosely Classical style by Willliam Lescaze, who had only recently emigrated from Switzerland and had not yet embracd the International Style Modernism that would becomehis signature. 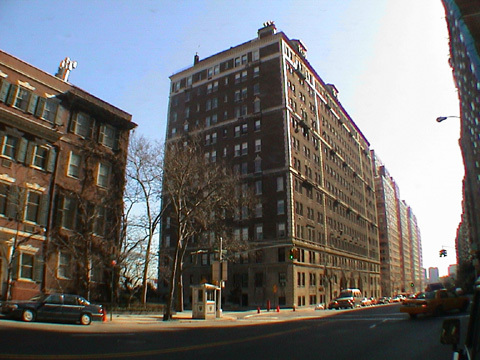 Other blocks of Sutton Place were developed with apartments during the 1920s. After the stock market crash a remaining row of riverfront tenements owned by the Phipps estate was converted by Mrs. George Tuckerman Draper, the decorator, to provide small apartments for millionaires who were economizing, thereby initiating a trend toward tenement conversion for the middle and upper classes that would have a permanent impact on the entire Upper East Side. In 1934 a group of tenements at the corner of Fifty-third Street and First Avenue was renovated by Bloch & Hesse to form a modest enclave called Sutton Manor. In the renovation individual building entries were arranged to face an interior court landscaped by Margaret Baillie, which increased security, while freeing street frontages for lucrative retail shops. Baillie was responsible also for the exterior decorating scheme of white and brown strips on the corner building and light gray on the walls facing the courtyard....This trend toward side-street gentrification continued until World War II....Beginning around 1920, Joseph G. Thomas, a developer whose previous experience included the transformation of East Nineteenth Street into a 'Block Beautiful,' began to transform the stretch of East River shorefront that ran from Forty-ninth to Fifth-second Street into something of an American Venice....Joseph G. Thomas's first 'Venetian' project, Beekman Terrace of 1924, located on a rocky bluff at Beekman Place and Fifty-first Street, was a six-story apartment house designed in a loosely interpreted Venetian Gothic style by Treanor & Fatio in consultation with J. E. R. Carpenter. The building capitalized on the increasing desirability of Beekman Place, the houses of which had been taken over recently by writers and actors who had formed the Beekman Hill Association in order to oversee the orderly transformation of the former working-class neighborhood into what would become one of the city's most fashionable enclaves, a transformation highlighted by the completion of Bottomley, Wagner & White's 1931 skyscraper apartment building, River House....Van Wart & Wein and Treanor & Fatio's Beekman Mansion of 1926, another Joseph G. Thomas project, abutted Beekman Terrace's west flank and provided a ten-story Italian Gothic building that enjoyed views down the length of Beekman Place. Van Wart & Wein's Campanile Apartments of 1926-30, also developed by Thomas, at 450 East Fifty-second Street, complemented the squat massing of Beekman Terrace with a soaring shaft that rose from a landing stage at the river's edge. Turning a blank wall toward the city, where future structures might block its light, the Campanile was oriented toward the East River where its situation at the edge of a bluff permitted the develoopment of riverfront garden apartments below the street as well as a private boat landing at the river's edge. Sloan & Robertson's building of 1930 at One Beekman Place, at Forty-eighth Street, designed in consultation with Corbett, Harrison & MacMurray, anchored the neighborhood's southern gateway. Its severely detailed exterior sheltered lavishly planned duplex suites with loggias and balconies jutting out over the river. An elaborate club facility that included an indoor swimming pool occupied the lower floors and opened onto a waterfront terrace....By the early 1930s, Beekman Place, a slum only ten years earlier, was one of the city's most fashionable addresses, although some of the nearby side streets were slow to be gentrified. The dock off Fifty-third Street, just north of Beekman Place, was said to have inspired Sidney Kingsley's 1935 play, Dead End, which chronicled the passions and conflicts of a neighborhood divided by its wealthy and poverty-stricken residents." "Zeckendorf requested that Pei rethink the idea..., using as his model the principle of the tree, with utility and services contained in within the trunk. This idea had been advanced by Frank Lloyd Wright in his St. Mark's-in-the-Bouwerie apartment scheme in 1929 and was in the process of being realized for another building type in Wright's S. C. Johnson Research Tower in Racine, Wisconsin of 1950. Within two weeks Pei had turned Zeckendorf's idea into a sketch for a scheme he and Zeckendorf named the Helix, a cylindrical apartment building, ideally twenty-two stories, composed of concentric rings around a core. Inside the core were the elevators and fire stairs; in the innermost ring was a circular corridor for each floor and a mechanicl shaft; then came a ring of bathrooms and kitchens, followed by one of living quarters and an outermost ring of balconies. The key to the Helix design was flexibility: tenants could acquire or dispose of the wedge-shaped apartment units according to need....Although unsuccessul in developing the East Rver site, Zeckendorf continued to promote the Helix design, proposed a version ofit inthe mid-1950s for the Battery Park area in lower Manhattan, but he was never able to realize the scheme." 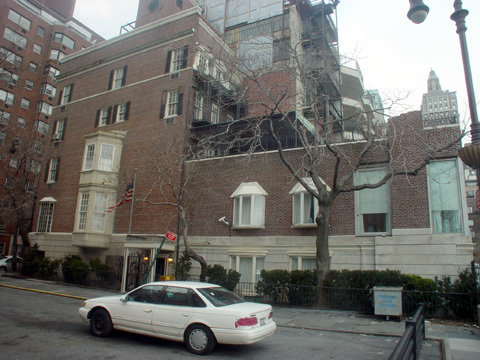 Mr. Pei is the owner of one of the townhouses between 57th and 58th Streets on Sutton Place.